The Royal Knights aren't featured heavily in this episode, and that's probably a good thing. 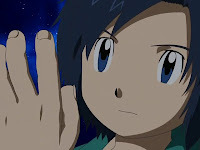 What we have instead is a strange change in setting where the digidestined don't have to deal with any villain, but struggle just to get back and rejoin the battle. It's a novel concept, perhaps, and filled with the odd sight of a lot of silliness entirely in their Digimon forms. Still, it's empty calories as we're not quite sure how they got to the moon and their return trip doesn't offer many surprises. It's one of those times when you can't ask too many questions. Crusadermon was mortified that despite the kids being on the ropes, Dynasmon flipped out and knocked them all to the moon instead of finishing the job. Why he did it, or even if he was conscious of his actions (that wyvern thing he became seemed pretty powerful and nobody this season has a good track record of controlling power) is confusing but the end result seems just as convenient. The denizens of the moon insist that getting back to the Digital World is nearly impossible. If anything, Dynasmon got the digidestined out of their hair without resorting to murder, which sounds like a pretty Royal Knight-y thing to do. Although the Royal Knights don't do much this episode, they may have had the more interesting moment. Crusadermon and Dynasmon, despite their efficiency, are complete morons for thinking that the answer to society's ills involve a combination of trusting a mythical demon lord and destroying the world for him. To go even deeper, however, Crusadermon hints that their service is coming at a price: they will destroy the Digital World for Lucemon if Lucemon gives them access to the human world. The Royal Knights are heralded as loyal defenders of the grand powers that rule the Digital World, and with the likes of Omnimon and Gallantmon among their ranks they sound like really swell guys. But once you realize that “the grand powers that rule the Digital World” may be just as corrupt as your typical modern government, suddenly it's not hard to understand why they're the bad guys every single time they show up. It's really easy to picture them as snobbish, looking down on the plebeians that comprise most of the world's population. Crusadermon and Dynasmon (and likely others in their ranks) may view the world with contempt, making them eager to blow it up and try out that shiny new place on the other side of the tracks. Granted, they're still idiots for believing Lucemon will hold his end of the deal. Back on the moon, there's not much to talk about other than Koichi questioning how he got through all that unscathed. Everybody else is knocked out cold, leaving it up to Koichi to find help (Lord knows Bokomon and Neemon wouldn't be able to). He comes through, but asks some pretty intriguing questions along the way. It feels early for Koichi to already be transitioning into his next character arc, having only been with the team for nine episodes (and reduced to the background for several of them), but as we enter the home stretch, we should be thankful that there's at least one bit of mystery for us to ponder over. Everything else is just silly. The kids, rather arbitrarily, spirit evolve to plan out a return to terra firma, which leads to a bunch of slapstick as each of them try to work something out. 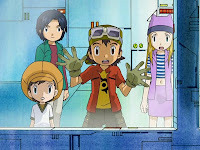 It's odd to see physical comedy from evolved Digimon, especially with no humans around. While it's amusing enough, hearing characters like Agunimon trying to sustain a voice that's usually reserved for lots of screaming just sounds weird. It's all moot, as the solution comes from a rocket that was just lying around and a bunch of local Digimon who want nothing more than to get rid of these kids. Between the lesson in relative gravity, the hyperbaric chambers in the station, the electromagnetic plot device and the rocket, you'd almost mistake this episode for having educational value. Alas, you're not likely to reach escape velocity using a slingshot made of tank treads. If nothing else, we got one last hurrah from KendoGarurumon and BurningGreymon. It's impossible to take Agunimon seriously after he suggested attacking the darkness in order to propel the moon towards the Digital World. Kumamon's track and field exhibition wasn't a shining moment either. Did we really need a callback to the Burgermon from episode 19? It's like a strange wormhole between two filler episodes. If JP is actually smart enough to understand all those equations, he's as smart as Izzy. Therefore, it's mathematically impossible that JP actually understands those equations he was writing. 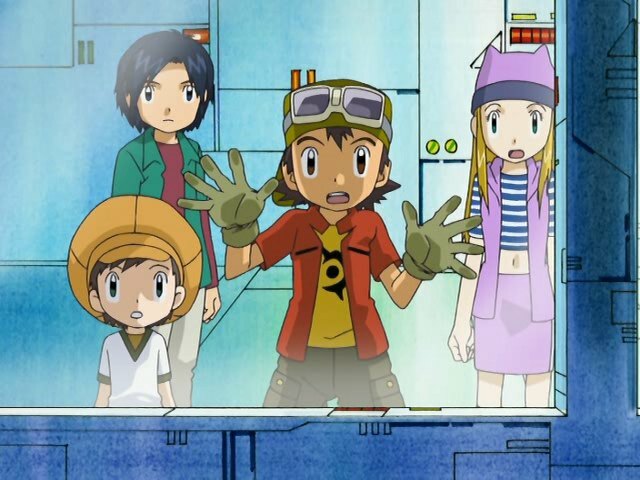 How the hell did BurningGreymon get out of the hatch, fix the course of the ship, and get back in without killing himself and everybody on board? The last data point! I was asking myself the very same question. Takuya's inside, then he's suddenly outside as BurningGreymon, then back to Takuya, now inside. Was that magic? Ah yes, I was somewhat disappointed that they didn't use a mass driver to get the rocket off the Blue Moon. Though if the mass of the moon is low enough, the slingshot may be enough to get it off the surface, providing a head start for said rocket to use it's engines to achieve escape velocity. ^ If said rocket actually had a engine that is. I always liked JP's line as the cast realizes they just dramatically fired off their attacks at absolutely nothing. "That should take care of... whatever we were shooting at!"